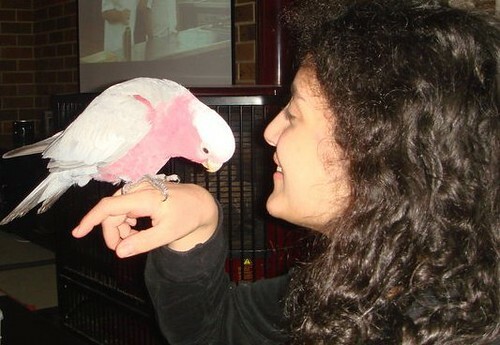 ‘Larry’ is our very loved galah parrot. He is obnoxious, hilarious, lovable and cheeky just like Larry David.We adopted him at 9 months of age to help us get over the tragic loss of our previous parrot ‘Nachos’. He was hand raised and was already starting to talk and was mostly used to females. However, my husband has managed to win his love over and convert him to a more male-oriented bird. The tricky thing with parrots is they will over bond with one owner and so get quite protective over them. This means that I have to fight it out with ‘Larry’ on a daily basis to get my husband’s attention. ‘Larry’ has got my husband wrapped around his little claw like you would not believe. The things he is allowed to get away with like chewing our keyboard to shreds or pulling a strap off my brand new work shoes to etc. If any other pet did that, they would definitely get the cold shoulder from my husband but not ‘Larry’. We have had a big scare with our ‘Larry’ and so have become quite hyper-attached to him. He accidentally escaped into the wild and managed to survive for 2 whole months. It was a windy day and my husband had started training him to go outside with him. He usually never left my husband’s side and we were not fans of clipping his wings. Unfortunately it was a windy day and so the accident was bound to happen. He flew up into the sky and drifted away within seconds. We could not believe how amazing his first flight had been. We searched and searched for hours to try to track him. We put up posters of him everywhere. I even contacted all the wildlife carers and vet clinics in the region asking them to call me if anyone brought in a talking galah. We were hopeful because we had ‘Leilah’ and she was Larry’s better half. We hoped he would find his way back home if he had heard her famliar squawk. After one month, we started to feel less hopeful and tried to get used to the idea that he was gone and most likely dead. Suddenly one day we heard a galah chirping and talking to ‘Leilah’ and she was responding to him and their chatter sounded so recognizable. We ran outside and tried to glimpse a good look at him to see if he had a ring on his leg but it was difficult to identify on a moving target. We were so frustrated because we thought we were just being foolishly hopeful. We were well aware that hand raised parrots are killed by wild parrots and rarely survive in the wild and so it would be unrealistic to assume that ‘Larry’ had finally tracked us down through ‘Leilah’. Time went on and we stopped dwelling on the thought of ‘Larry’and were considering re-homing ‘Leilah’ because she seemed very lonely. Then I acquired ‘Jerry’ another parrot from the clinic and introduced him to ‘Leilah’. Two months had passed now and as I finished my last consultation and went into the backroom, my vet team looked up at me very excitedly and said: ‘We think Larry’s back, we just picked him up from a lady who found him!’. I jumped to my feet and ran to the galah they had in a cage infront of them. He had a ring and he looked up at me and said ‘Hello’ in that all too familiar voice. I would have expected to cry so much at that moment. However, the shock of the news made it so surreal and I was still not sure he was our parrot and did not want to be disappointed. I was scared to believe it was him and then find out I was wrong. I just wanted to take him home because I knew Wally would definitely know if it was him. I delivered him to a very ecstatic Wally. Wally instantly knew without a single doubt in his body that it was ‘Larry’. We thanked the finders and my vet team so much for bringing our ‘Larry’ back to us. They informed us how they came across him. ‘Larry’ had gotten himself caught in a fence during the floods and was retrieved ever so gently by a dog and taken to the dog’s owner. The wonderful dog had only covered our ‘Larry’ with heaps of slobber. The owner of the dog then put Larry in a cage to contemplate about what to do with him. She then heard this wild galah say ‘Hello’ and she thought she must be imagining things. She had a closer look and this bird was talking to her. She immediately called our vet clinic because she was a client of ours and fortunately not the other local clinic. Erin, was the vet nurse who took the call and put two and two together and highly suspected this was ‘Larry’ and drove up to get him immediately. Thank you Erin and Chris for the effort you put in to get my baby back to me. Being a vet, I asked my husband to keep ‘Larry’ isolated from our other two parrots for at least 2-4 weeks because he may have picked up diseases in the wild and I did not want him to transfer them to the other two . We simply could not bear to see how lonely he looked in his cage so we put him in with our other parrots earlier then we should have. It was a really beautiful reunion to watch. ‘Leilah’ was all over ‘Larry’. She was super excited to have him back. He was very upset because we had clipped his wings and he was back in a cage. We will never clip his wings again because we saw how much it affected him psychologically! It took a couple of weeks to get him settled and back to his happy old cheeky self. It is not often that you get a second chance to be reunited with your parrot and we know how lucky we are! We strive so hard to give ‘Larry’& ‘Leilah’ a very enriched cage full of fresh bark, native plants and a range of good quality food. As they always say, you can tell a parrot is happy if it has a huge mess around its cage. Our parrots keep us very busy with all their demands and we know we are doing something right when we see there big mess. Hey Rosie, it really makes me happy to share a story that touches someone and cheers them up. :-)..he sure is a cracker. Glad to hear you got Larry back – you were very lucky he survived for two months in the wild. The videos were great – they are such funny little characters! That is a wonderful story! 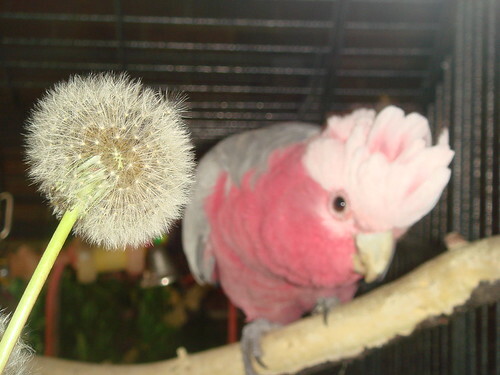 We adopted a baby galah two years ago and he became a treasured member of our family. Lord Gargar had a large outside cage and also an inside cage in my daughters room. I would clip his wing and he would walk around the garden with us. We were all very attached to our cocky, but then ten months ago he flew away (or was picked up in a gust of wind). We searched for weeks, contacted the vets, put up posters and even a lost message over our local radio station. I looked at three other “lost” galahs that had been found though they weren’t ours – and you can really tell if it is your bird; you just know! After a few months went by we came to the realisation that he was gone :C My daughter would not let me sell his cage as she kept saying that he would come home eventually. Well, after being “lost” for ten months my next door neighbours found our cocky in their backyard. You can imagine my daughter’s face when they brought him back to our house! Lord Gargar was looking very fat and healthy; and his wing feathers were grown so he could fly. We don’t know where he had been or if he had been cared for by someone or was flying free – we will never know. He took his place back in our family as if he had never left. Now we have a dilemma; my husband doesn’t want me to cut his wing and wants to set him free as he’s been flying free for ten months. I’m just not ready to let him go again as we’ve really missed him. He may not survive in the wild or be as lucky as before. Should I look at getting him a mate?